The civil affairs bureau in the Laoshan district of Qingdao, Shandong province, will reconstruct tombs on Laoshan Mountain and punish those who are found illegally buying or selling burial spaces, Wang Shaomei, director of the bureau, said on Saturday. "We will continue to encourage people, as we have done in past years, to place the ashes of their loved ones in memorial halls rather than tombs," Wang said. "For people who insist on constructing tombs, we will transform them into garden-like cemeteries by planting trees and replacing upright stone slabs with stones that lie down. "We will also look into illegal graveyards. And people who are found to be involved will be punished." 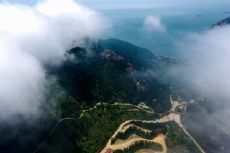 Wang made the remarks after China National Radio recently reported that quite a number of tombs had been built and graveyard spots had been illegally bought and sold on Laoshan Mountain, a national 5A scenic spot east of Qingdao beside the Yellow Sea. According to the report, a number of tombs could be seen scattered in the forests alongside the road upon entering the scenic spot. Parts of the forests had been destroyed to make space for the tombs. Carvings on the slabs indicated that most tombs had been built between 1997 and 2018. Next to some tombs were some freshly burned offerings. The report also said some residents in urban Qingdao had purchased graveyard land from Laoshan village officials to build tombs. Small plots generally cost 60,000 yuan ($9,000), while large plots of 100 and 200 square meters could cost hundreds of thousands of yuan, and were purchased to build spacious cemeteries for big families. Local media reported that there were more than 60,000 tombs scattered in the mountains and forests of Laoshan district as of March last year. Some local people still observe the tradition of burning offerings, causing forest fires from time to time. Regulations on funerals and interment stipulate that the construction of tombs is forbidden on farmland, in forests, in urban gardens, at scenic spots or at historical sites. In addition, cutting down trees without permission and destroying mountain forests violate regulations. To reverse the situation, Wang said Laoshan district undertook reforms of funerals and interment last year. It is urging people to sweep tombs without burning and encouraging them to place the ashes of their loved ones in memorial halls or build garden-like tombs. So far, four memorial halls have been built in the district. Jiang Duntao, secretary of the Laoshan district committee of the Communist Party of China, told the radio network that the committee has noticed the issues and has taken action to address them. "We will spare no effort in solving these problems," he said. "Reforms began last year, and it will take a few years to see the effects."